Celebrating with your nearest and dearest is at the heart of most couples’ wedding days and if you’re lucky enough to have everyone you love there, then you are truly blessed. Sadly, for many of us, we may have lost a parent, relative or friend who we wished could have seen us walk down the aisle and live happily ever after. While nothing can replace a loved one being at your wedding, there are a few lovely ways that you can include them in your big day. Paying your respects in a way that is fitting to you and the relationship you shared with the person you lost will be more genuine and heartfelt than doing something completely out of style or character, so to help you out, I’ve put together a list of 8 different ways you could include them in your wedding, from subtle and sweet to quirky and unique. Some couples choose to leave an empty chair at the ceremony or reception as a tribute to a lost loved one, perhaps even placing their photo or a single flower on the seat. This makes quite a big statement and would be a fitting tribute to a deceased parent or sibling but may be very emotional for you if your loss is still very raw, so consider carefully how you’ll feel about seeing the empty chair and how that will affect your day. Flowers have the ability to evoke emotions in us and the combination of the sight and smell of your loved one’s favourite flowers are sure to conjure up happy memories while you walk down the aisle, eat the wedding breakfast and dance the night away. I always remember my nan loved Lilies and I still think of her when I catch the scent of them in the supermarket now. 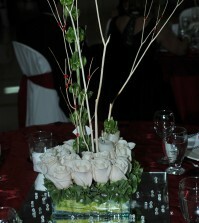 More subtle than an empty chair, this is a way for you to honour your loved one a little more privately. Hayley decided to incorporate flowers in a different way; her granddad always carried Lavender in his pocket, so Hayley ordered one of my Lavender hair pins and a matching buttonhole for her mum as a tribute to her granddad. She also had a pin made in blue, for her “something blue”, which I absolutely loved! There are lots of lovely ways that you could incorporate items of clothing. You could stitch a small scrap from a shirt into your wedding dress, use one of their handkerchiefs to wipe away happy tears (I surprised myself by how weepy I was on my wedding day! ), wrap one of their ties or silk scarves around your bouquet or even have their wedding dress refitted and restyled for you to wear yourself. A couple of nice buttons from a shirt or jacket sewn on to the handle of your bouquet, dress or suit would make a lovely subtle tribute too. Wearing a piece of their jewellery, particularly something sentimental like their engagement or wedding ring is sure to make you feel their presence, plus it doubles up as your something old and something borrowed, so a win-win all round! 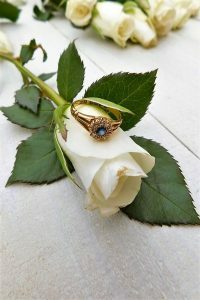 And if you don’t want to wear a piece of their jewellery, why not incorporate it into your bouquet? 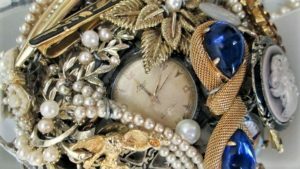 Brooch bouquets are growing increasingly popular these days and can take a variety of forms, with some including a mix of fresh or artificial flowers and a few brooches, to complete vintage works of art, crafted from pieces of costume and antique jewellery. The beauty of brooch bouquets is that they last forever and you could even have a go at creating one for yourself if you feel like getting creative! My favourite thing about designing brooch bouquets for brides is hearing all the lovely stories behind the pieces of jewellery they ask me to include. Katie’s grandparents had sadly passed away before her wedding so she sent me pearl necklaces and her grandfather’s cracked watch to put into her bouquet; They added a sentimental and vintage element to her bouquet and Katie said that she felt like her grandparents were with her on her wedding day – how lovely is that? Did your loved one have a favourite poem or song that you could include in your wedding? Save them a dance and twirl around the dancefloor when their favourite song comes on or use their favourite poem as part of the ceremony (depending on the nature of it of course!) or speeches, or even before the wedding breakfast to start the celebrations. Again this can be as subtle or obvious as you like and gives you a chance to honour your loved ones privately or publically. 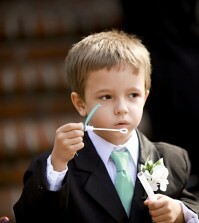 Displaying photographs of your loved ones at your wedding is another way to include them. Go big and bold and create a display showcasing your happiest memories together or keep it subtle with a memory locket or bouquet charm. Kelly’s dad sadly passed away when she was little and she wanted to carry a locket with his photograph attached to her bouquet. Her fiancé, Dan, wanted to honour his granddad too, so they sent me some photos of the two men and I resized them using Photoshop to fit inside a locket and a pair of cufflinks. 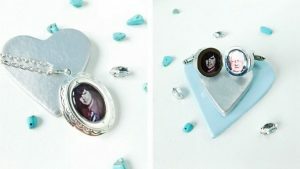 I love this idea as it’s something you could easily do yourself with a bit of photo editing software to resize your images and you can pick up blank lockets and cufflinks from craft stores or online fairly inexpensively too! This is slightly offbeat, but an idea I love nonetheless! If you’ve decided to have a personalised cake topper, you could include elements that remind you of your lost loved one. Meg and Jerry did this beautifully; Jerry’s dad had sadly passed away and so he and Megan decided to pay tribute to him in their cake topper. 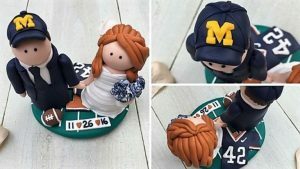 Jerry wore a cap in honour of his dad, so we added that to the cake topper, along with the football gear that Jerry himself wore in his college football days. You can read more about Megan and Jerry’s story here (elsaroseboutique.com/blog/2016/10/12/behind-the-scenes-an-all-american-cake-topper)! However you choose to honour your lost loved ones, I hope it brings you a sense of comfort and a feeling of their presence on your special day. What ways do you plan to include those you’ve lost in your wedding? I’d love to hear your ideas so feel free to leave a comment below! THIS is a very good post. There are many times this will happen and even though we do not plan it, bringing those people along to the wedding is a great idea. Thanks for the tips. I think that if you have a board up with photos of them that is a great way to “bring” them to the wedding after they have passed. It will also give others another chance to remember them. I think this is a very important detail that many people forget about. My uncle was married and his father died a few months before that and it was hard to not mention him.